The candidate filing deadline was March 8, 2018 and the primary election was held on June 5, 2018. Four-term Democratic incumbent Dianne Feinstein won reelection in 2012 with 63% of the vote, taking the record for the most popular votes in any U.S. Senate election in history with 7.86 million votes. Feinstein is the ranking member of the Senate Judiciary Committee. She turned 85 years old in 2018, leading to speculation that she would retire in January 2019, as her long-time colleague Barbara Boxer did in January 2017. However, Feinstein stood for reelection for her fifth consecutive term, winning 44.2% of the vote in the top-two primary; she faced Democratic challenger Kevin De León in the general election, who won 12.1% of the primary vote. For the second time since direct elections to the Senate began after the passage of the Seventeenth Amendment in 1913, no Republican appeared on the general election ballot for U.S. Senate in California. The highest Republican finisher in the primary won only 8.3 percent of the vote, and the 10 Republicans only won 31.2 percent of the vote between them. ^ a b No ballot access: Constitution Party and Socialist Equality Party. Don J. Grundmann (C) and David Moore (SEP) appear on ballot as "No party preference". Democratic candidates won a combined total of 4,231,444, Republican candidates 2,216,223 votes, and other candidates 223,053 votes. Because of California’s top-two runoff system, the seat was guaranteed to be won/held by a Democrat since the initial primary produced two Democratic candidates. The race had an undervote of around 1.3 million votes compared to the gubernatorial election, likely by Republican voters choosing neither candidate. De León won many of the same counties won by Republican gubernatorial nominee John Cox, as many voters may have expressed opposition to the incumbent senator. Blue represents counties won by Feinstein. Orange represents counties won by de León. 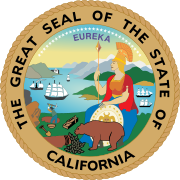 ^ "United States Senate election in California, 2018 - Ballotpedia". Retrieved December 23, 2017. ^ Charles Mahtesian (November 26, 2012). "Feinstein's record: 7.3 million votes". Politico. Politico. Retrieved December 16, 2012. ^ "Essential Politics: State Senate committee moves to assist immigrants, what California's members of Congress are saying about Trump's executive order". Los Angeles Times. ISSN 0458-3035. Retrieved July 20, 2017. ^ Mehta, Seema (January 17, 2017). "What will Feinstein do? California Democrats await senator's re-election decision to plot their own futures". Los Angeles Times. ISSN 0458-3035. Retrieved July 20, 2017. ^ a b "Statement of Vote" (PDF). Retrieved July 15, 2018. ^ McGreevy, Patrick. "With his political clock ticking, state Senate leader Kevin de León keeps mum about what he'll do next". Los Angeles Times. Retrieved September 23, 2017. ^ Bowman, Bridget; Bowman, Bridget (October 15, 2017). "De Leon to Challenge Feinstein in California Senate Race". Retrieved January 20, 2018 – via www.RollCall.com. ^ Shelbourne, Mallory (October 15, 2017). "Calif. Dem announces Feinstein challenge". TheHill.com. Retrieved January 20, 2018. ^ Wire, Sarah D. (October 9, 2017). "Sen. Dianne Feinstein says she'll run again: 'There's still so much work left to do'". Los Angeles Times. Retrieved October 9, 2017. ^ "California 2017 General Election". www.thegreenpapers.com. ^ "HARRIS, EUGENE PATTERSON - Candidate overview - FEC.gov". FEC.gov. ^ Hartson, Alison. "Alison for California". Retrieved November 2, 2017. ^ Wire, Sarah D. (2 November 2017). "New liberal challenger to Sen. Dianne Feinstein launches bid on 'The Young Turks'". Los Angeles Times. ^ CNN, Gregory Krieg,. "'Justice Democrats' launch new California Senate candidate". CNN. ^ "Bernie Sanders supporters announce Dianne Feinstein primary challenger, tell her to join GOP". Newsweek. 2 November 2017. ^ Sommer, Will (2 November 2017). "Progressive group backs new Feinstein challenger". TheHill. ^ "David Hildebrand for U.S. Senate 2018". DavidForCalifornia.com. Retrieved January 20, 2018. ^ "HILDEBRAND, DAVID - Candidate overview - FEC.gov". FEC.gov. Retrieved January 20, 2018. ^ "BRENNAN, CHRISTOPHER - Candidate overview - FEC.gov". FEC.gov. ^ "PAGE BY PAGE REPORT DISPLAY FOR 201702010200050167 (Page 1 of 4)". docquery.FEC.gov. ^ CNN, Gregory Krieg,. "2018 California Senate race expected to get more crowded". CNN. Retrieved 2017-10-14. ^ "New primary challenger to Feinstein emerges". ^ "California politics news feed". Retrieved January 20, 2018 – via LA Times. ^ "California Billionaire Will Not Run in 2018 Elections". NBCConnecticut.com. Retrieved January 20, 2018. ^ "Liberal online news host Cenk Uygur considering Senate run in California". ^ "Contest/Candidate Proof List, Qualified and on Ballot, Statewide Primary Election 5-June-2018: Voter Nominated Offices United States Senator" (PDF). Website of the Secretary of State - California. sos.ca.gov. p. 14. ^ California Secretary of State. "CANDIDATES FOR JUNE 5, 2018, STATEWIDE DIRECT PRIMARY ELECTION" (PDF). CA.gov. California Secretary of State. Archived from the original (PDF) on March 25, 2018. Retrieved May 11, 2018. ^ "A neo-Nazi is polling 2nd in race to unseat Feinstein. Here's what SLO County GOP says". sanluisobispo. Retrieved 2018-05-12. ^ Garofoli, Joe. "Patrick Little, neo-Nazi Senate candidate, banned from state GOP convention". San Francisco Chronicle. Retrieved 30 July 2018. ^ "TAYLOR, PAUL ALLEN MR - Candidate overview - FEC.gov". FEC.gov. ^ "Search results - FEC.gov". FEC.gov. ^ "COSON, GARY LYNN - Candidate overview - FEC.gov". FEC.gov. ^ Estrada, John [@johnestrada] (February 8, 2018). "Join the 49er club! John Estrada U. S. Senate 2018 California Republican P. O. Box 6631 Fresno, California 93703 www.gopradio.us $49 help defeat Dianne Feinstein" (Tweet) – via Twitter. ^ "TIM KALEMKARIAN S18 COMMITTEE - committee overview - FEC.gov". FEC.gov. ^ "SAAVEDRA, JAZMINA - Candidate overview - FEC.gov". FEC.gov. Retrieved January 20, 2018. ^ "SCHRADER, STEPHEN JAMES - Candidate overview - FEC.gov". FEC.gov. ^ "Kevin Faulconer, San Diego mayor, quietly mulling run for governor". Politico.com. Retrieved January 20, 2018. ^ "How California lawmakers have tried and failed to fix the state's housing crisis". Retrieved January 20, 2018 – via LA Times. ^ Manchester, Julia (July 16, 2017). "Caitlyn Jenner weighs run for Senate". The Hill. Retrieved July 16, 2017. ^ Washington, Arlene. "Arnold Schwarzenegger shoots down US Senate run". AOL. Retrieved March 13, 2017. ^ Mehta, Seema (November 2, 2017). "Republican Ashley Swearengin says she won't run for governor or U.S. Senate in 2018". Los Angeles Times. ^ "Laguna Beach Local News Laguna Local to Make a Bid for the Senate". Laguna Beach Local News. 2018-01-18. Retrieved 2018-04-04. ^ "Candidates for Public Office". Constitutionpartyofcalifornia.org. Retrieved 2018-04-04. ^ "Socialist Equality Party announces California candidates in midterm elections". Wsws.org. 2018-04-03. Retrieved 2018-04-04. ^ "OLSON, LEE W - Candidate overview - FEC.gov". FEC.gov. ^ "SHI, LING LING - Candidate overview - FEC.gov". FEC.gov. ^ "CARROLL, JERRY LEON - Candidate overview - FEC.gov". FEC.gov. ^ "HODGE, CHARLES JUNIOR - Candidate overview - FEC.gov". FEC.gov. ^ "MEAD, RICHARD THOMAS - Candidate overview - FEC.gov". FEC.gov. ^ "ROBERTS, CLIFTON - Candidate overview - FEC.gov". FEC.gov. ^ 548-4345, Bob Kasarda bob.kasarda@nwi.com, (219). "Vegan in the Region: The Humane Party". nwitimes.com. ^ a b Carney, Jordain (2018-05-04). "Obama endorses Feinstein amid challenge from left". TheHill. Retrieved 2018-05-04. ^ a b "Biden endorses Feinstein's re-election bid: 'She's tenacious. She's accomplished'". TheHill. 2018-03-29. Retrieved 2018-04-04. ^ a b c d e f "California's old guard Democrats under siege". Politico.com. Retrieved January 20, 2018. ^ a b Marinucci, Carla (September 14, 2017). "Senator Kamala Harris, darling of progressives, says she'd support a Feinstein re-election bid '100 percent'". Politico. Retrieved September 15, 2017. ^ a b CNN, Eric Bradner,. "#2020Vision: Harris backs Feinstein". CNN.com. Retrieved January 20, 2018. ^ a b c d e f g h i j "Dianne Feinstein, 84, is seeking another Senate term. Who might challenge her?". DailyNews.com. October 9, 2017. Retrieved January 20, 2018. ^ a b c d Wire, Sarah D. (15 October 2017). "Why a new progressive congressman has been pushing for a Democrat to challenge Feinstein". Los Angeles Times. ^ a b "Nancy Pelosi endorses Dianne Feinstein for re-election to Senate, heading off possible primary challengers". Fox News. October 31, 2017. ^ a b c d O'Keefe, Ed (2017-10-09). "Dianne Feinstein, oldest U.S. senator, announces re-election bid". Washingtonpost.com. Retrieved 2018-04-04. ^ a b "Gov. Jerry Brown endorses Sen. Dianne Feinstein". Los Angeles Times. April 10, 2018. Retrieved April 18, 2018. ^ a b c d e f g h i j k l "California politics news feed". Los Angeles Times. ^ a b "Bad news comes in bunches for Kevin de León: Key lawmaker backs Feinstein". June 12, 2018. Retrieved September 4, 2018. ^ a b c d "California politics news feed". Los Angeles Times. ^ a b Mehta, Seema. "Los Angeles Times". LATimes.com. Retrieved January 20, 2018. ^ a b Cadelago, Christopher (October 20, 2017). "Steinberg chooses Feinstein in 'difficult' decision". The Sacramento Bee. ^ a b c d e f "California politics news feed". Los Angeles Times. ^ a b "EMILY's List Endorses Nine Democratic Women Senators for Re-Election in 2018". EMILY's List. February 10, 2017. Retrieved February 16, 2017. ^ a b "Equality California Endorses U.S. Senator Dianne Feinstein in 2018 Reelection Race". www.eqca.org. ^ a b "HRC Endorses California Senator Dianne Feinstein for re-election". Human Rights Campaign. April 18, 2018. Retrieved April 19, 2018. ^ a b "Dianne Feinstein". Project100.org. Project100Women.org. Retrieved November 18, 2017. ^ a b Palmer Report (2018-02-25). ""Palmer Report endorses Dianne Feinstein in the Democratic primary. She's spent decades skillfully using her seat to move America to the left. Her primary opponent is well intentioned, but purist progressive foot stompers rarely deliver actual progress for the left."". Twitter.com. Retrieved 2018-04-04. ^ a b "Editorial: Chronicle recommends Dianne Feinstein for U.S. Senate". San Francisco Chronicle. 2018-04-18. Retrieved 2018-04-19. ^ a b "Reelect Sen. Dianne Feinstein". Los Angeles Times. 2018-05-04. Retrieved 2018-05-04. ^ a b c d e f g h i j k l m n o p q r s t u v w x y z aa ab ac ad ae af ag ah ai aj ak al "Endorsements". Retrieved 2018-04-27. ^ a b "Billionaire Democratic activist Tom Steyer endorses Kevin de Leon in his insurgent bid against Sen. Dianne Feinstein". Los Angeles Times. April 18, 2018. Retrieved April 19, 2018. ^ a b c d e f g h i j k l m n o p q r s t u v w x y z aa ab ac ad ae af ag ah ai aj ak al am an ao ap aq ar as at au av aw ax ay az ba bb bc bd be bf bg bh bi bj bk bl "Endorsements". Kevin de Leon for Senate. Retrieved April 13, 2018. ^ a b De Leon, Kevin (15 October 2017). "REP. JIMMY GOMEZ ENDORSES KEVIN DE LEÓN FOR U.S. SENATE" (PDF). Los Angeles Times. ^ a b "Kevin de León announces run against Dianne Feinstein, setting up Democratic clash in Senate race". The Mercury News. 15 October 2017. ^ a b c d e f Mehta, Seema; Mason, Melanie (15 October 2017). "California Senate leader Kevin de León announces he will challenge Sen. Dianne Feinstein". Los Angeles Times. ^ a b Roberts, Jerry. "Newsmakers With Jerry Roberts | Santa Barbara, California". Newsmakers With Jerry Roberts | Santa Barbara, California. ^ a b c d e f g h "4 SF supervisors back de Leon against Feinstein in U.S. Senate race". San Francisco Chronicle. ^ a b "4 SF supervisors back de Leon against Feinstein in U.S. Senate race". San Francisco Chronicle. ^ a b Tolan, Casey (July 14, 2018). "California Democratic Party endorses De León for Senate, in rebuke for Feinstein". Mercury News. Retrieved July 14, 2018. ^ a b "Armenian Committee endorses Kevin de León for U.S. Senate". January 9, 2018. Retrieved January 9, 2018. ^ a b Ford, Mary Kelly (November 8, 2017). "Cal Berkeley Democrats endorses Delaine Eastin for California governor, Kevin de León for US Senate". The Daily Californian. Retrieved November 10, 2017. ^ a b "CLIMATE HAWKS VOTE SURVEYS CALIFORNIA MEMBERS: KEVIN DE LEON OR DIANNE FEINSTEIN?". Climate Hawks Vote. Retrieved November 3, 2017. ^ a b Mehta, Seema; Mason, Melanie (October 15, 2017). "California Senate leader Kevin de León announces he will challenge Sen. Dianne Feinstein". Los Angeles Times. ^ a b "Democracy for America : Democracy for America backs Kevin de León in California U.S. Senate race". www.democracyforamerica.com. ^ a b "Gavin Newsom, Kevin de León win backing of major California labor group". sfchronicle.com. ^ a b c d Mehta, Seema. "Kevin de León boosted by back-to-back union endorsements in Senate bid against Sen. Dianne Feinstein". Retrieved 15 February 2018. ^ a b "JOINT COUNCIL 42 ENDORSES KEVIN DE LEON FOR U.S. SENATE SEAT". Retrieved 9 March 2018. ^ a b "UFCW Western States Council Endorses Kevin De Leon for U.S. Senate". Retrieved 9 March 2018. ^ Prins, Nomi. "Twitter". Twitter. Retrieved 2018-04-14. ^ Martin, Abby. "California voters have an open primary June 5th but still need to register by Monday. I'm excited to vote for progressive @HartsonForCA to replace Feinstein, socialist @GloriaLaRiva for Governor, @peaceandfreedom's Kevin Akin for Treasurer". Twitter. Retrieved May 20, 2018. ^ justicedemocrats.com. "Justice Democrats Candidates". now.justicedemocrats.com. Archived from the original on June 27, 2018. Retrieved November 2, 2017. ^ "The Young Turks on Twitter: "Who Will Alison Hartson Represent? via @YouTube". Twitter.com. 2017-11-05. Retrieved 2018-04-04. ^ "Lt. Governor Candidate Gayle McLaughlin Announces 2018 Endorsements". HighlandNews.net. Retrieved January 20, 2018. ^ a b c d e f g h i j k l m n o p q r s "Endorsements". davidforcalifornia.com. Retrieved April 13, 2018. ^ "California - CWAC". candidateswithacontract.com. ^ "James Bradley Is Endorsed By Carl DeMaio For US Senate". KOGO (AM). ^ "Endorsements". Erin Cruz for US Senate. Retrieved 2018-04-04. ^ a b c d e f "Endorsements". Erin Cruz for US Senate. ^ "Erin Cruz For U.S. Senate - CA on Facebook". ^ "Lets Make California Golden Again! #FireFeinstein". www.crowdpac.com. ^ "REAL ERIN CRUZ on Twitter". ^ Cruz, Erin (March 5, 2018). "#CrushCorruption Endorsement Speech, #MAGA" – via YouTube. ^ "I've Been Busy". wordpress.com. April 22, 2018. ^ Libertarian Party of California (April 29, 2018). "2018 LPC Convention Day 2" – via YouTube. ^ "Derrick Michael Reid on Twitter". ^ Richard, Bob. "Election 2018: Greens Endorse Four Statewide Peace and Freedom Candidates - Peace and Freedom Party". www.peaceandfreedom.org. ^ a b "Campaign finance data". Retrieved April 23, 2018. ^ John Melendez* (D) 4%, Other 2%. *Withdrawn. ^ David Hildebrand (D) 2%; Donald Adams (R), Jerry Leon Carroll (NPP), Pat Harris (D), Richard Mead (NPP), Douglas Howard Pierce (D), Steve Stokes (D), and Michael Ziesing (G) with 1%; Clifton Roberts (H) 0%; Other 1%. ^ "2018 Senate Endorsees - JStreet". ^ "California Democratic Party abandons incumbent Feinstein, endorses opponent". Retrieved September 4, 2018. ^ Silver, Nate. "California - 2018 Senate Forecast". FiveThirtyEight. Retrieved October 20, 2018.